The best answer I can give to my customers is that it is NEVER too cold to pour concrete in NC if you order the concrete correctly, and have the proper equipment and field knowledge of how to pour in cold weather. The only issue is that it is usually not practical for contractors to own some of the things that are used in year round cold places. Heater blankets can run from $350-500 for just a 20 square foot piece, and most jobs we do are more than 500 square feet (although we love the small jobs as well!!). In other words, it would require up to $7,500 just for enough blankets to cover a 500 sq ft patio. For this reason alone, most local contractors do not have heater blankets. One possible alternative is to rent heater blankets, but even then you are subject to availability. Concrete creates its own heat, and until it reaches 500 psi (which usually happens within 24 hours), it is critical to protect it and/or add additives to the concrete. You should also order the concrete with hot water so that it cures quicker. If concrete freezes while it is still fresh or before it has reached 500 psi to resist the expansive forces associated with the freezing water, ice formation results in the disruption of the cement paste matrix causing an irreparable loss in strength. You can accelerate the concrete to 500 psi by adding chloride, or non chloride calcium, and then protect the concrete with an alternative method (like plastic and hay) once it has reached 500 psi. You can use mathematical and scientific formulas to try to gauge whether or not it is safe to pour, but there are countless hidden factors that cannot be covered in this blog that weigh in. So it all comes down to your contractor. Does he know your area? Weather trends? 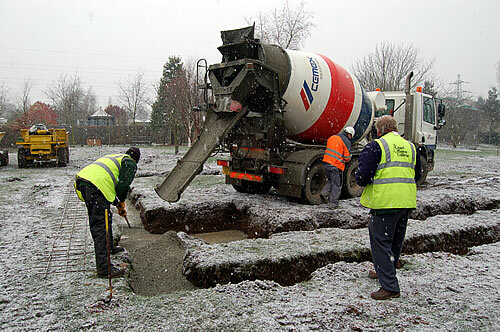 How to order concrete from each supplier? Does he have a warranty that will back up the product in case an unexpected occurrence happens leaving you with a concrete spiderweb for a patio? If you ask me these questions, I will give you a resounding YES to all of them. Furthermore, I will not risk pouring if I feel that it is not the right time, unless you sign off saying that you wanted it poured even though I told you that it was a bad idea! Concrete cures slower, allowing us more time to finish it. In the summer sometimes the hot weather causes the water to evaporate too fast leading to more micro cracks. The leaves of the fall are gone. We aren’t as rushed as in the springtime (our absolute busy season). You can even ask us about our December-February Winter pricing which is a little less than on-season pricing.